Adventure Solutions offers a wide range of services to help you with your project. Whether it is a simple concept for a zipline, or an entire adventure park layout, we can help you plan, design, construct and install your project…on budget, and on time. We also offer turnkey services that help you get your adventure business up and running quickly, with minimal headaches and interruptions. Finally, Adventure Solutions can assist you with marketing strategies and guidelines for profitability, safety inspections, site planning and staff training. You build it with our experience. We realize many businesses have in house construction capabilities. Adventure Solutions Design / Supply service starts with a complete set of engineered construction documents. We provide any specialty hardware / products that you can not source directly and we include 1 builder to oversee your construction team. 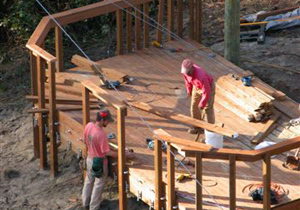 This solution combines your construction expertise with our design and specialty equipment. Let us handle everything. We design, fabricate and install the entire project. By choosing design/build you tap into the benefits of time savings on project completion, cost savings, and improved communication between the design and construction teams. Choose design/build for the whole project or just the critical areas – We can help you decide. Adventure Solutions offers formal land surveying for lay out of your project. We use commercial survey equipment to determine GPS, elevations, distances and angles between activities. This formal process assures the best outcome for your project. Site planning offers customers a visual perspective for how the project will be laid out. Adventure Solutions offers formal site planning for those projects that require it as part of the permitting or for those customers looking for a more formal process. Our initial planning includes discussions / meetings to understand your goals, budget and design vision. We then take a look at your site to assess the physical layout and conditions. From this, we are able to develop a course layout and design for the overall project using concept sketches, 2D and 3D digital designs. Your review and acceptance of the proposal officially kicks off the project. Looking to build a zipline but not sure where to start. Our cable sag analysis report starts with formal survey points to determine ground line contour, arrival / departure tower requirements and cable sag to assure every line is designed with optimal slope and appropriate toe clearance for riders. We include sag analysis for rider and ice conditions. This approach assures lines are accurately hung for ultimate safety. Adventure Solutions offers civil, structural and geotechnical engineering services. All of our systems, aerial adventure courses and ziplines are crafted by experienced engineers, licensed in all 50 U.S. states and most of Canada. Our adventure systems combine character with strong visual appeal and unparalleled safety, in order to provide you with exceptional pieces for your business. Through our engineering excellence and passion for quality, innovation and safety, we produce designs that are visually stunning, incredibly safe, and able to withstand years of heavy use. Adventure Solutions is a pioneer in the construction of adventure systems. Many of our products are designed and fabricated at our U.S. plant by experienced designers and engineers. Our facilities include steel and wood fabrication and computerized CNC. We offer many in-house services that our competitors do not. By directly manufacturing the end products we are able to maintain quality and assure all parts of the systems fit prior to field installation. We also offer professional paint services. Once our master designers and fabricators create your custom pieces, we ship them from our U.S. facilities to your location. Once installed, these systems will provide years of heavy-duty use, indoors and out. For aerial courses and ziplines, our installers install them using platforms, ropes, cables, bridges and whatever else you might need to build your dream course. Obviously, safety is fundamental. Ours continues from the initial design and construction through to actual customer participation. In addition, because of the inherent exposure faced by adventure industry companies, Adventure Solutions carries a $2 million general liability insurance policy that covers products and completed operations for all of our clients (we can also add your company to our policy as an additional insured). In fact, we carry $1 million more than most other companies in the industry. No other adventure company can match our extreme commitment to our clients! After installation, Adventure Solutions doesn’t just leave you “hanging.” We can meet with you and your staff to teach course operations, safety and technical skills, emergency planning and adventure course care. In addition to staff training, we can assist you with marketing strategies and guidelines for profitability. Course inspections are paramount to providing long term safety. Our experts return to your site quarterly, bi-yearly or yearly, depending on needs and usage, to conduct safety inspections of your equipment and installation. We believe a properly planned project leads to better outcomes and quality. To this end, we combine our proven project management methodology with a web-based project management tool to ensure that all of our projects stay on track and on budget. On a weekly basis, our project managers meet with the client team and other stakeholders to ensure that milestones are being met and team members are well-informed and connected. We also use ProjectManager.com, an online project management tool that simplifies project planning, tracking and reporting. Using this application, our builders update their project timeline online every day, which is then broadcast to the entire team through the web portal. This innovative tool allows all stakeholders to view the real-time status of their project—no matter where or when they log in—ensuring enhanced communication, improved risk management, and better efficiency and effectiveness of services. We are proud of Adventure Solutions project management process, and are not aware of any other adventure company that manages its projects this way. Adventure Solutions can incorporate lighting to allow for night operations and to help your business standout.